We used to cram our passenger cars to bring all the different flashing devices to the particular events. But times have changed and we don’t want to travel hundreds upon hundreds of kilometers by brimful cars anymore. Unfortunately, we are not able to inaugurate our nice new transport aircraft, because there are no runways in our backyards and around HAR area respectively. 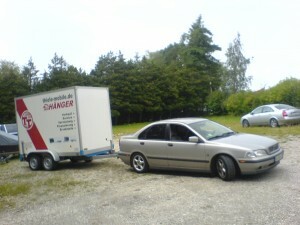 Hence, ST worked out another answer to the problem and chartered a trailer, that we picked up on monday. HAR, we’re coming!